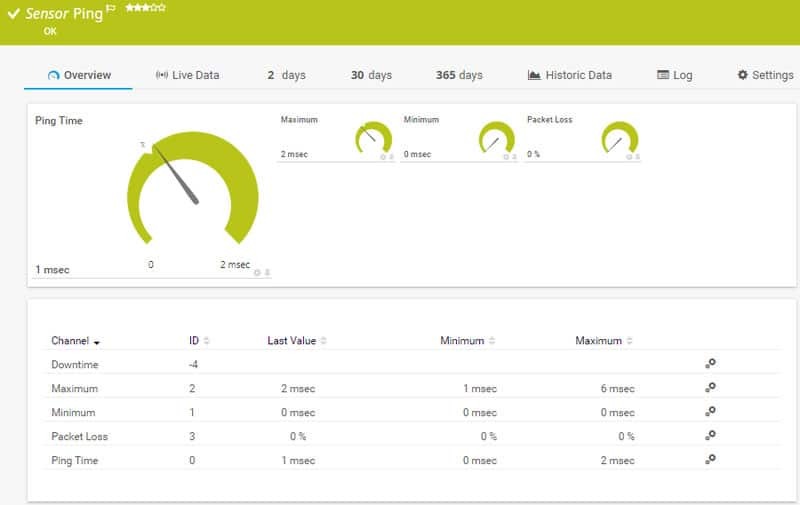 Monitoring software able to track latency can give you an overall perspective of the availability and health of your network. 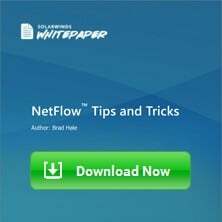 Other capabilities such as generating visual traceroutes or displaying packet loss percentage can also help you troubleshoot network issues. 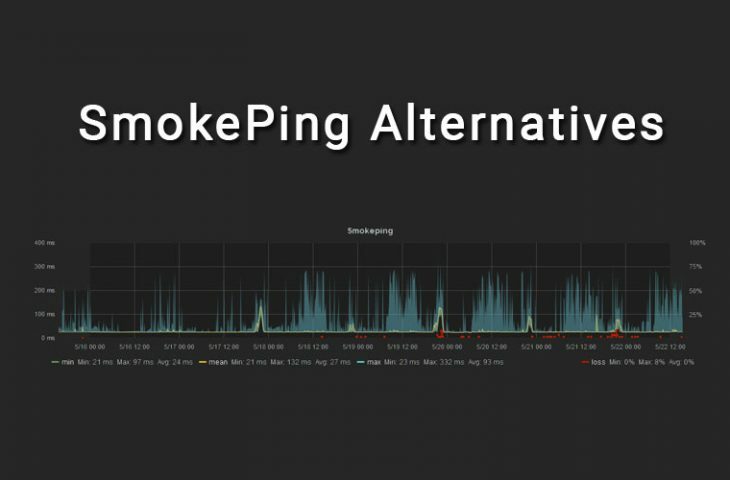 A popular open source network latency monitoring tool is Smokeping, developed by Oetiker. This tool shows network performance by collecting data and displaying it in real-time through advanced graphics. Smokeping uses RRDTool to maintain its store and for the graphing back-end. It provides amazing graphical results, but nothing textual. Smokeping is not able to produce in-depth error reports. Although there is a team of developers and users removing existing problems, there is no official team currently working on upgrades. Dealing with PERL and environment management can be challenging. It does not provide enough information about incidents in the network that are not related to availability. Below you'll find a quick description of each product, some screenshots and download links to try them if you so please. We suggest you grab a few of these to see which one fits your needs, as they all have either Free Trials or are Completely FREE To Use! 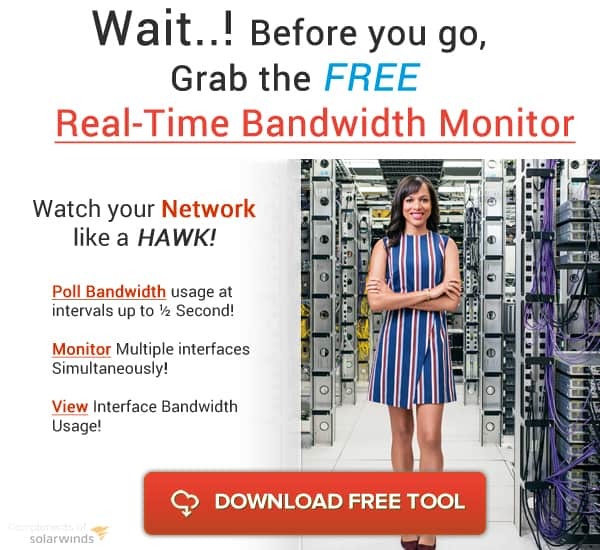 TracerouteNG from Solarwinds is an Upgrade from the Original command-line Traceroute tool that gives your a stand-alone version of a great network analysis and troubleshooting tool. With Continous TCP & ICMP tracing features and Hop-by-Hop analysis, this tool makes for a great addition to any Network Engineers toolbox. A networking diagnostic tool, PingPlotter combines ping, traceroute, and whois functionalities to collect data. The tool is able to graph packet loss and latency between source and destination. PingPlotter is a great tool for troubleshooting, it lets you know which hop is dropping packets. By visualizing the network performance graphs in detailed, you’ll be able to find traffic bottlenecks and dead-ends in your network. Why is it a good alternative to Smokeping? PingPlotter can be easily installed on Windows, MacOS, and iOS. Smokeping on the other hand relies on other tools and services to work. Aside from having Unix OS and Perl installed in a server, you’ll need other components. Some Special Features of PingPlotter? Various targets at a time. ICMP, UDP, TCP packet types. Metrics: Jitter, MOS, Latency, and Packet Loss. Alert events and set conditions. PingPlotter comes in three different editions. Purchase Professional for $199.95 with full features, Standard for $39.99 with limited features, or Free with basic features. Get a 14 day free trial of the PingPlotter Professional. An open source project originally developed by BitWizard. My TraceRoute or commonly known as MTR is a network diagnostic tool that combines traceroute and ping functionalities. With its capabilities, MTR can analyze the network connection between the source (MTR host) and destination. 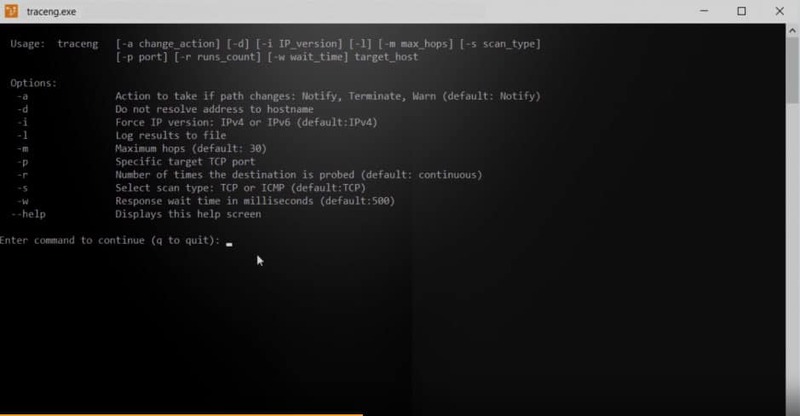 The tool sends ICMP ECHO requests to the destination to determine the quality of the connection. MTR is perfect for spot checks and troubleshooting. MTR is supported only by Unix-like OSs. A Windows equivalent to MTR was created by a different developer and is referred to as WinMTR. Why is it a good alternative to Smokeping? MTR is frequently used for spot checks or troubleshooting. 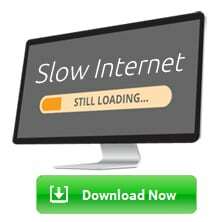 It is vulnerable to changes in traffic, such as packet loss and latency. MTR is better for collecting data close to the time of an event. But on the other hand, analyzing historical data is much easier with Smokeping, because it will monitor for an extended period of time. MTR is open source and free. You can get the software from a GitHub repository, or from BitWizard FTP at ftp://ftp.bitwizard.nl/mtr/ or https://www.bitwizard.nl/mtr/files. An agentless network monitoring software developed by Paessler AG. PRTG can monitor and analyze different network conditions and gather statistics from network devices or applications. Although PRTG is far from a simple ping and traceroute tool, it is based on a system of sensors, which work based on pings. When a network element goes offline, PRTG will send alerts to let you know about the failure. The PRTG Sensor Ping can gather data and display maximum and minimum latencies, and packet loss in real time. Why is it a good alternative to Smokeping? If you have the budget for a comprehensive monitoring application that goes beyond a simple ping, the benefits are beyond measure. PRTG has no match here. It can find, classify, and map all devices on the network. Then monitor them, alert failures, and create reports. PRTG has six different price plans and one that is 100% free. The price is based on the number of sensors, rather than the number of monitored devices. Starting at PRTG500, that allows you to monitor 500 sensors for $1,600 a year. You can get an unlimited free trial version for 30 days. Once expired, the license will revert to the %100 free PRTG100 for unlimited time. Nagios specializes in network monitoring software development. 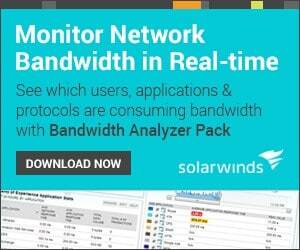 Their tools are capable of monitoring full networks, servers, or applications. Nagios has two important monitoring tools, Nagios Core which is free and open source, and Nagios XI which is the enterprise edition. 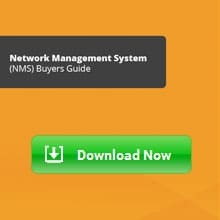 Nagios is able to monitor networks and systems, and find failures related to broken communication, connections in bad shape, or incorrect configurations. The software provides complete monitoring capabilities with Ping, including packet loss and reachability. With Nagios, you can implement effective ping monitoring and troubleshoot availability issues. Nagios Core is known for its engaged community. The software is able to monitor almost anything you can imagine thanks to the official Nagios plugins and the ones created by the community. Determine the threshold to get notifications. Create HTML output that links to a traceroute CGI. Nagios Core is free and open source. Core XI starts at $1,995 for a standard license edition. Get the full and free Nagios Core, or download a full-featured 60 days trial of Core XI from Nagios official site. An open source network monitoring and graphing tool. Cacti was built based on the data storage tool RRDTool. It also supports SNMP for network management and monitoring, and MRTG for graphing. Cacti is commonly used as a graphing tool for time-based metrics, such as network utilization or CPU. The web-based user interface makes it easy to monitor small to medium size networks. Similar to Smokeping, Cacti uses RRDTool to maintain its data store. Both products can only be installed in Unix and Linux distributions. The main difference is that Smokeping is much easier to install, while Cacti is a bit tricky. But if you have the time to learn and install Cacti, you’ll reap the benefits. Cacti is very flexible, thanks to the support of thousands of plugins. 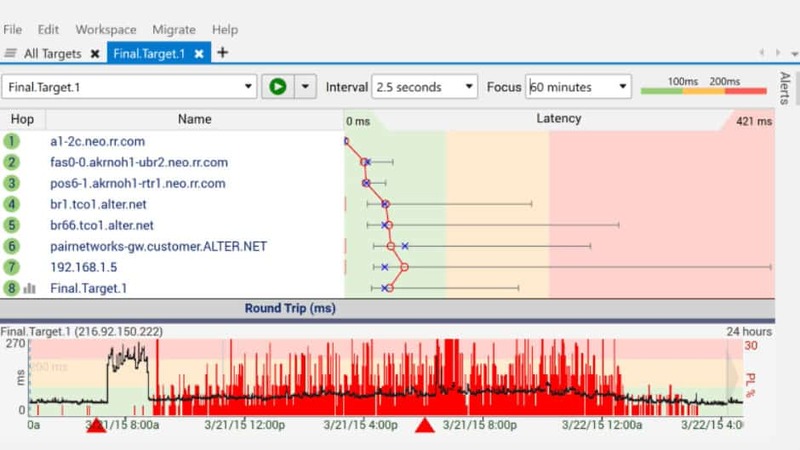 Monitor latency and packet loss with advanced ping. Ping ICMP, TCP, or UDP protocols. You can even choose different port numbers. Great graphing capabilities. Allows you to view data in great detail, you can also vary graph displays. Get Cacti from its official site. A lightweight tool for single or multiple target monitoring and alerting. MultiPing allows you to check multiple targets at the same time and provide historical information about the data collected. This information is displayed in a simple graphic format. The timeline graphing feature is one of the most powerful qualities of the software. With historic information, you can evaluate the uptime and quality of a link. 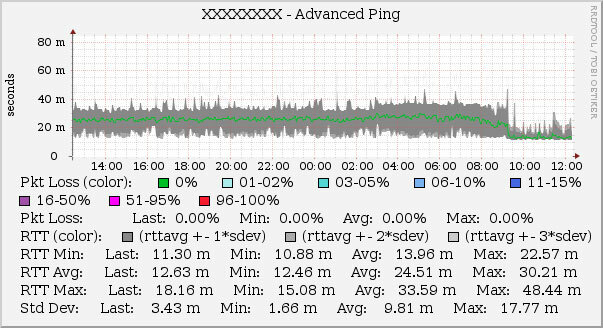 The software displays key metrics such as packet loss in the graph. MultiPing joined forces with PingPlotter for advanced troubleshooting. 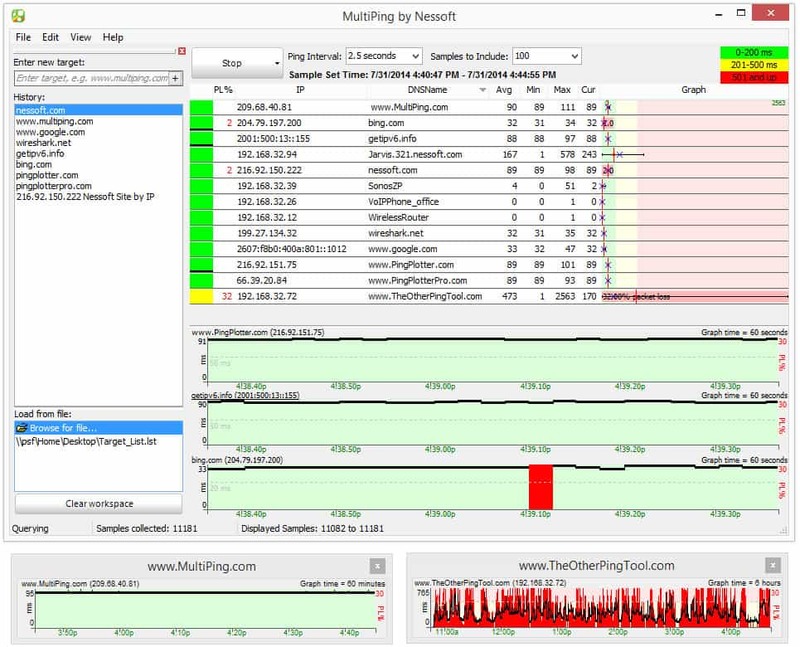 MultiPing gets help from PingPlotter to provide a per-hop delay, and MultiPing is great for finding latency trends on multiple sites. 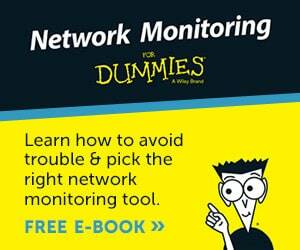 Both tools can give you a better toolset to monitor, diagnose, and find problems on a network target. The single-user perpetual license is $39.99. Get a MultiPing trial for free.